The DBR10 Active PA speaker features the same Yamaha state-of-the-art DSP technology inherited from its predecessors, ensuring superior performance and versatility, and safe, consistent operation. 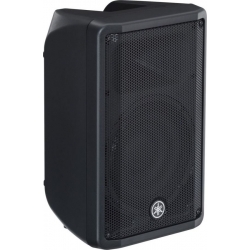 The DBR10 can project deep bass, clear midrange and accurate high frequencies to the outer-most edges of a very wide coverage area and can boast 700W of power. The design incorporates an optimised 50°　wedge angle for floor monitoring use and is also, for its size, the most portable powered speaker currently offered by Yamaha.